This entry was posted in Racing on December 13, 2011 by Steve Tilford. It is amazing to me the selection of cyclocross equipment now. The bicycle industry has really stepped up here, even though a lot of the stuff is never going to make them any money because the sales are always going to be relatively small. Yesterday the package from TRP brakes arrived in the morning with the new CX 8.4’s. 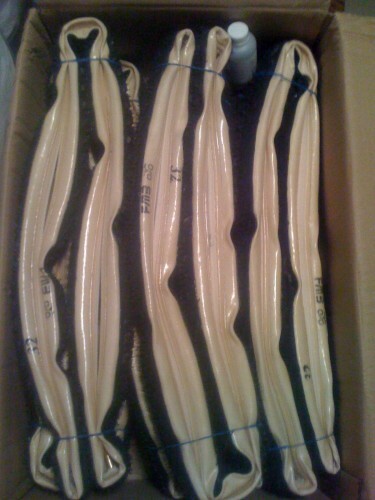 Then yesterday afternoon the box from Belgium showed with the handmade FMB tubulars with Michelin Mud 2 tread. Both of these items are really works of art. They look so nice and hopefully function just as good as they look. Less than 10 years ago, the selection of equipment was nothing. Back in the 80’s, you had to nearly fabricate your own equipment. I trained with the Czechoslovakian National Team in the winter of 1985 before the World Championships in Munich. They were the best cyclocross riders in the world, by far. A mechanic from their team made custom cleats that had threaded holes for spikes in them. The spikes were behind the cleats, since we were riding toe clips. The guy told me he would make me some cleats but couldn’t get any aluminum to fabricate them. I thought, what’s the big deal. So I took the train into Prague to get a couple aluminum blocks. I ended up spending two full days there going from business to business and never located enough aluminum to make the cleats. A week later, the mechanic came up to me and presented me with some cleats for Worlds. And they were very much needed in that race. When I think back upon it, that was probably the most memorable part, of nearly a month in Europe, going from shop to shop and meeting up with just regular Czech guys and seeing how commerce worked behind the Iron Curtain. Anyway, it is always cool to see innovation in equipment. TRP is obviously innovative with their new brakes. 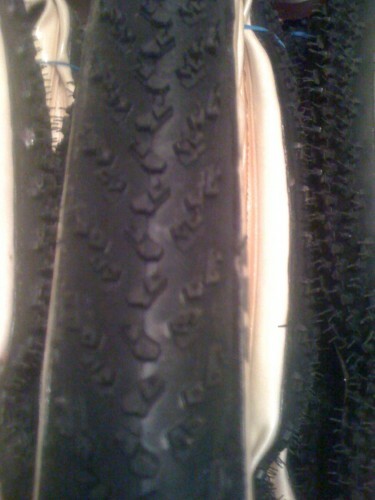 FMB is really not innovative, they are making custom tires, which to me seems incredible, no matter what the price is. It is a super cool aspect of cycling. I took the Michelin tread over to Europe. It is going to be interesting how well these ride. I've never ridden these casings, but the tread is 2nd to none in adverse conditions. 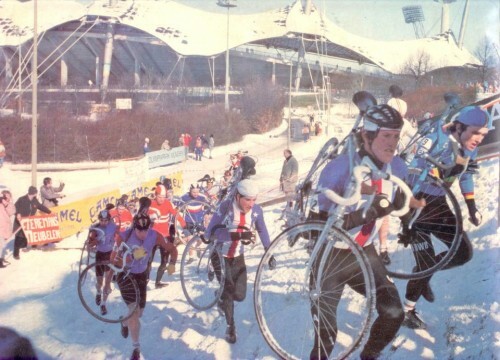 A photo from the Cyclocross World Championships in Munich. Dave Mac is the US rider behind me. This post really brings back memories of my late-80’s attempts at cyclocross. WTB toe-flips, coins under the pedals (for balance), and Mafac cantilevers. I modified soccer shoes by removing the front spikes and mounting pedal cleats to the soles. The only tire back then was the Specialized Tri-Cross (I still have one somewhere) and I raced on a Schwinn touring bike because I couldn’t afford a real, european cyclocross frame. Cool race pic at the Munich Olympia Stadium. I visited there in 84 & 85. I think you are going to love those brakes. They will send you over the bars if your not careful! They are way more responsive than the canti’s…. 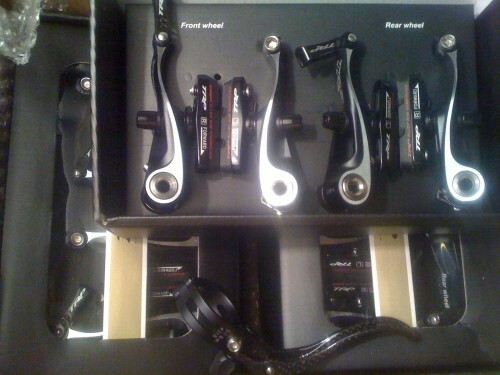 but I still think that they are a bit behind the curve, lets say they will become the poor mans disc brake for now. I am however excited to see what TRP has to offer in the future. What does FMB charge for that? Thinking of doing the same. This poor man’s ‘cross bike in that era was getting a used Peugeot made with Reynolds tubing and brazing canti-posts on. Soft, soft frame but it worked okay and was very light for the price. It bent back into shape when needed. I do not miss Mafacs one bit. Set up was awful for the slight bit of extra power. Switching to Shimano’s low-profile MTB cantis was a great day. Discs have such a limited strategic use in cross! As usual, cycling fashion dictates the local field will be bedazzled with disc equipped bikes for no good reason. Here’s a good rule: if you need disc braking power in cross, you are probably going too slow. Channel_Zero- I thought discs were to increase speed in slick conditions. Like coming into a corner faster….what do you mean too slow? How about giving all of us a non-biased view of those brake after riding for awhile. I think you are using some sort of linear brake with a travel agent right now. How do the new brakes compare? I think the average price of the bikes used for cross in Wisconsin in the late ’90’s cost less then the average wheel set being used now does. What would a 1980’s cross bike be like compared to today bikes? Better than a Surley cross check? Heavier or lighter? IMHO, discs might be an advantage when it’s crazy wet, yet somehow fast. A very unlikely combination! If someone needs that much braking power, you are either slowing down too much, or the course is closer to old-school mountain biking than ‘cross. Three Peaks would be a good place for disc brakes. Get out and ride whatever you’ve got! The true ‘cross bikes which came from Europe back then might be comparable to a Surly Crosscheck today. If anything, the Surly might have better tubing and workmanship and might even be lighter. The problem was finding a cross frame, or affording it when you did. Alan made some lighter weight frames that had aluminum tubing glued into alloy lugs, but they were very squirmy. Like Steve mentioned, there just wasn’t a lot of stuff available for ‘cross in the US back then.